Read the current publications on the SLM website for April 1-30, 2019. Write a comment on 2 or more of the publications posted on the SLM website for April 1-30, 2019. ​Note: Email address will not be made public. Note: Comment on the poems, book reviews, articles, interviews and guest posts. You once read a book that changed your life! Here is your chance to unlock another child's dreams at little cost! The #3000BooksIn30Days was sparked weeks ago by a conversation with a brother-friend who recognized the impact of CTCTW in the lives of numerous children across the world, beginning from Ogbomosho. He said, “I can recognize the impact of what you are doing with CTCTW" and asked to know how he could volunteer while highlighting glaring literacy challenges children face in Ogbomosho and beyond. You, just like this brother-friend are as crucial to the fulfillment of the #3000BooksIn30Days for children of Ogbomoso as a book is window for children to see beyond their limited spheres and reach the world just at their fingertips when they dare to dream. 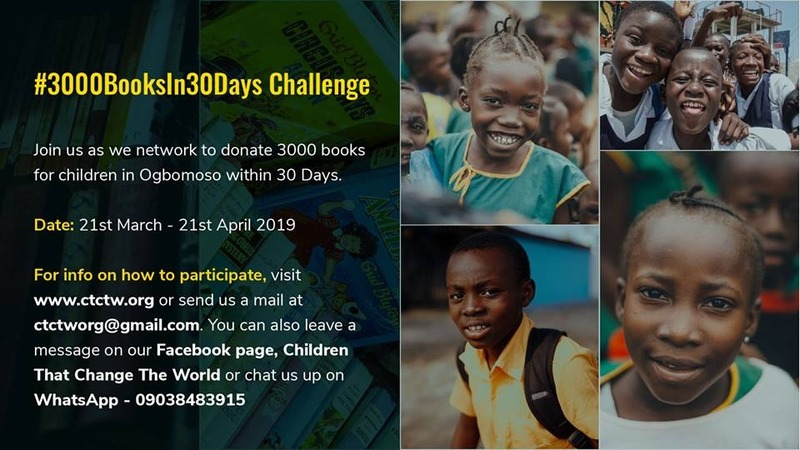 The launch of the #3000BooksIn30Days challenge has been paired with the World Book Day holding on the 23rd of April, 2019. Just one book from you can make a child's day, and even more books can be the key to unlocking their imaginations to potentials and achievements beyond their limitations. An EXCERPT FROM "BUT HERE YOU ARE"
moment that she could find. ​IS IT TRULY A TIME TO BE ALONE? Tolu Akinyemi, Author of "Your Father Walks Like a Crab"
& Oyindamola Shoola, Author of "To Bee a Honey"
At the core of all these reasons we gave for not wanting to have children in the future was a form of selfishness or self-centeredness that I could strongly identify with. At this point, Tolu and I elaborated on the consequences of this ideology that being self-centered is profitable which many motivational speakers preach. I have heard stories of speakers who decided to quit their day job, leave their family and travel to many places just to please themselves. I have heard and read about some feminists recently who state that because men have benefitted from women’s oppression for so long, any man that can’t meet the needs of a selfish and self-centered woman - who only wants isn’t worthy of having their time or attention. I have been stalling on writing a review for What a Time to Be Alone by Chidera Eggerue for over two months now, first because, it is taking me time to accept what the book offers, digest it, reevaluate myself and my life and fix things where necessary. Second, I don’t think there can ever be a review that fully captions and evaluate all that What a Time to Be Alone by Chidera Eggerue offers. Just imagine a combination of all your favorite motivational speakers in one book but from an extremely raw perspective and unapologetic voice. As a reader, What a Time to Be Alone has the power to unseat almost everything that you have thought wrongly about yourself, other people and that other people have thought about you. 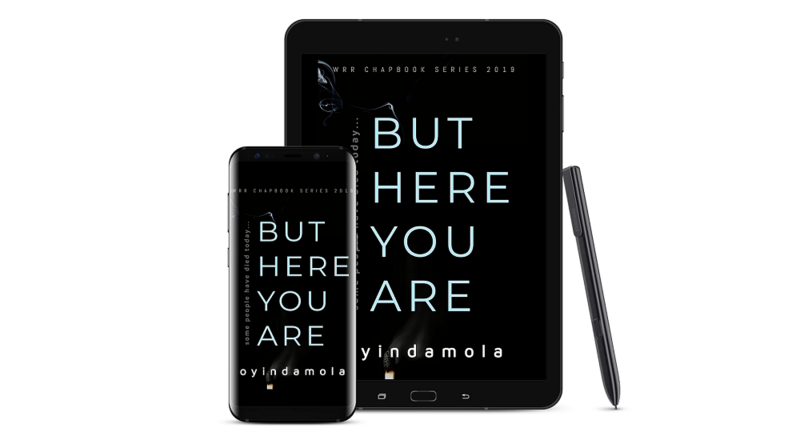 I read What a Time to Be Alone by Chidera Eggerue shortly after New Year celebrations, and while recommending it to other people, I simply told them to ditch the other New Year resolutions books to pick something real like this book. This interview was conducted by Uduak-Estelle Akpan. Why is poetry your choice genre? I always say, Poetry chose me. & even when I dabble into other genres, you can see the poetic impulse, floating in between the words. Why are you passionate about mental health advocacy as it is evident in your writings? I have a mental illness, & have tasted of what stigma does to healing. How it ruptures the process. How it renders hope inept. I find it a personal responsibility to dismantle the culture of silence surrounding mental health. Does one need any special attribute to be a good poet/ what in your opinion is that special thing? Thirst. There has to be a perpetual thirst for the betterment of the craft. Vulnerability too. In poetry, the poet rather than the tongue, speaks with the heart. You studied accounting in your first degree, is there any clear relationship between that and your work as a poet? I would say, the ability to search for imbalances & attempt to rectify them. The accountant balances the books, the poet balances the soul. Do you care about distinguishing your work from that of other writers/how do you make sure of that? Personally, I feel that a good poem is in itself unique. Doesn’t have to struggle to distinguish itself. A poet’s voice is sharpened through constant tonguing of self-truths, however frightening. & the reader will always recognize such a voice, though blindfolded. How do you balance your day to day engagements with the demands of writing? Honestly, I have no clue. But I guess it has to do with the fact that, there is thirst. So regardless of my activities, I always come back into a poem to marinate. Who are the five Nigerian writers that inspire you? This is a hard one. I have lots of them. 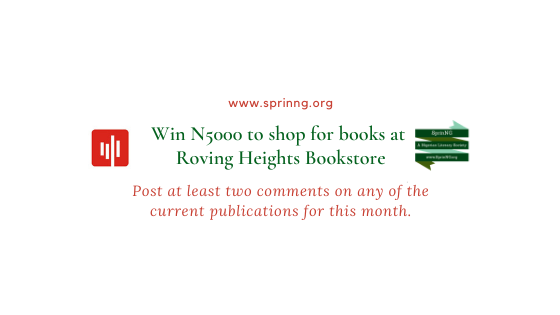 Which are your top five Nigerian books?